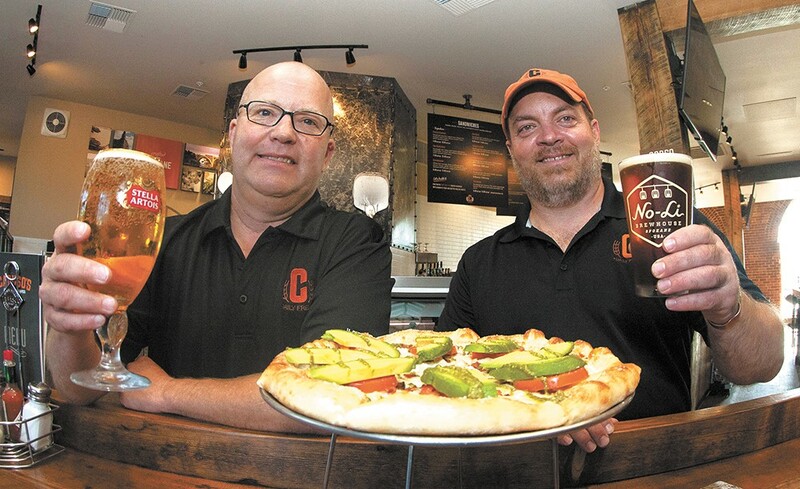 Caruso's Jay Jordan and Vince Caruso celebrate the opening with a cold beer and the Tuscan pizza. Booths lining the back walls, rows of tall tables taking up a majority of the indoor floor space and umbrella-covered tables on the patio surrounding an elevated fire pit are filled with people excitedly reaching onto each other's plates to try bites of different pizza slices. After working on a rebranding for the past two years, Caruso's has expanded from Spokane Valley and Coeur d'Alene to its new location in a renovated pocket of downtown Spokane's U District. Caruso's manager Jay Jordan describes this expansion as a way to come together with GVD Commercial Properties, the owner of the new Ruby Suites hotel (formerly the Burgan's Furniture building) that houses Caruso's, to offer quality food — fresh salads, pasta, sandwiches and pizza — to more people. All of their bread is baked fresh daily and their dough is hand-tossed. Mozzarella, provolone, chicken breast, bacon, Roma tomatoes and avocado on an olive oil base drizzled with basil pesto sauce all come together to create their Tuscan pie, one of the most popular items on the menu. When designing the layout of the new location, transparency was a major focus. "What we do will be visible to the customers," says Jordan. "We want to let them craft their own food and watch us build it." The tables where the salads, pasta and sandwiches are made have been turned around to face the customers, and the pizzas are topped in front of them — even on one of Caruso's signature pies — before being popped into the ovens. "Our food travels well, so it can be delivered and is also available for pick-up, not to mention that we also cater," says Jordan. Jordan believes this new location is unique because it's at the cross-section of many demographics, providing space to host big events, gather for game days, or bring the family.